One less mainstream piece of this inflation hysteria boom is the velocity of money. In case you haven’t yet heard, monetary velocity is rising.  From that we are supposed to infer all the usual – wages, inflation, higher rates, and utter destruction in bonds if not the whole Western economic structure. The first part is technically true. Money velocity increased in at least two primary stock indications. Against both M2 and MZM, velocity has accelerated for two straight quarters (through Q4 2017). The former has risen from 1.426 in Q2 2017 to all of 1.431 in Q4; the latter went from 1.295 to 1.299 in those same six months. I have said nothing above about the much-discussed “velocity-of-circulation” of money, and its supposed effect on prices. This is because I believe the term “velocity-of-circulation” involves numerous irrelevancies and confusions. Strictly speaking, money does not “circulate”; it is exchanged against goods. Since 2008 the changes in velocity are explained entirely by either slight increases or decreases in nominal GDP balanced against large increases (or now smaller decreases) in the proportion of whatever stock measurement attributable to the leftovers on the liability side of the Fed’s balance sheet (bank reserves). 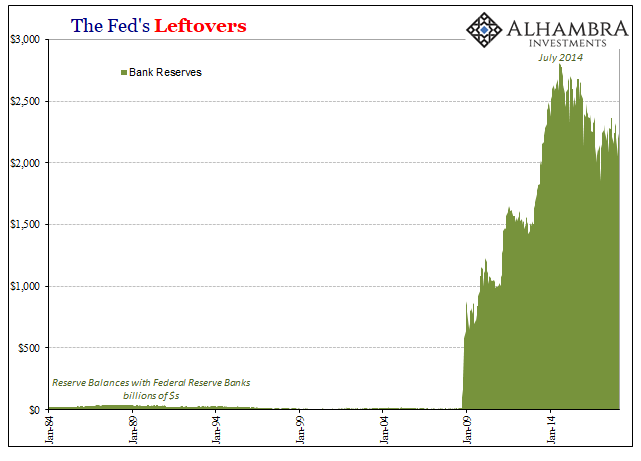 In other words, QE1 along with other “emergency” (ineffective) programs started balance sheet expansion, which as an accounting matter vastly increased the level of bank reserves. What didn’t change much, however, was either output or inflation. In fact, any correlation between velocity (MZM; M2 just doesn’t fit at all) and calculated inflation broke apart substantially in the mid-nineties (no surprise that; RiskMetrics and dark leverage). Though you don’t hear much about earlier episodes, this is not the first time velocity has risen, either. Over the last ten years, we can observe accelerating “velocity” on two prior occasions, both greater than the one observed in 2017 (and the first, in 2009-10, for longer duration). In both cases, nominal GDP accelerated while changes in the money stock increased more or less in constant fashion (QE1 during 2009-10; tapered QE3/4 during the middle of 2014). 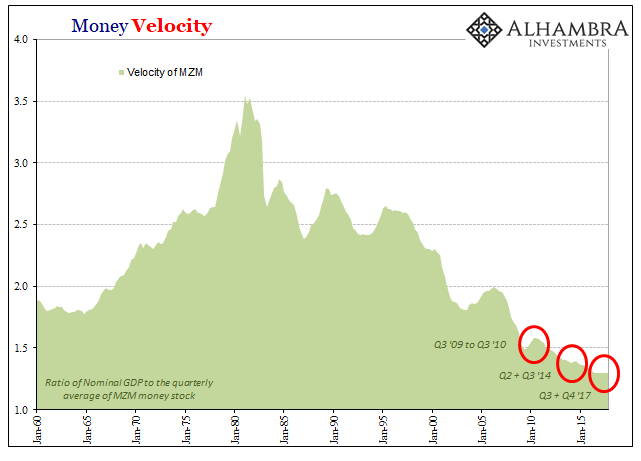 In that first case, rather than leading toward rising inflation, money velocity fell (sharply) starting in Q4 2010 – the point at which the Federal Reserve initiated QE2 because nominal (and real) output tailed off dramatically. Thus, again, velocity was a mere accounting issue caught up as a redundancy; or, as Hazlitt put it, an irrelevancy. In the second case, the two middle quarters of 2014, velocity rose on the strength of uneven nominal output at that moment at the apex of an upturn. With the Fed’s contributions to these versions of money stock more or less steady, velocity was forced higher. 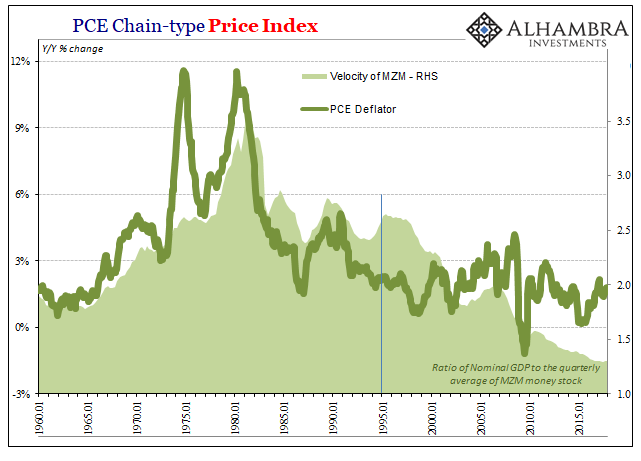 Rather than again lead toward inflation as so many hypothesized, the other occurred due to non-transitory “transitory” factors, namely the eurodollar money stock that is precluded from all these calculations. The current (small) rise in velocity is once more simple mathematics. Nominal output is slightly higher over the past few quarters while the Fed’s balance sheet, particularly the leftovers in bank reserves, is generally lower since 2014’s taper. In other words, these calculations for velocity give us no additional information beyond that which we already know from pretty much everything else. Like the M’s behind these numbers, they’ve been obsolete for a very long time. Appealing to money velocity as a basis for inflation expectations in 2018 is another one of those highly desperate over-interpretations that have become quite common. In reply, Mr. Coombs said an effort could be made to develop such a measure, but he doubted that it would be successful. The volume of funds which might be shifted back and forth between the of the monetary statistics arose in connection with Euro-dollars; he suspected that at least some part of the Euro-dollar-based money supply should be included in the U.S. money supply. More generally, he thought M1 was becoming increasingly obsolete as a monetary indicator. The Committee should be focusing more on M2, and it should be moving toward some new version of M3–especially because of the participation of nonbank thrift institutions in money transfer activities. The problem is that we cannot extract from our statistical database what is true money conceptually, either in the transactions mode or the store-of-value mode. One of the reasons, obviously, is that the proliferation of products has been so extraordinary that the true underlying mix of money in our money and near money data is continuously changing. 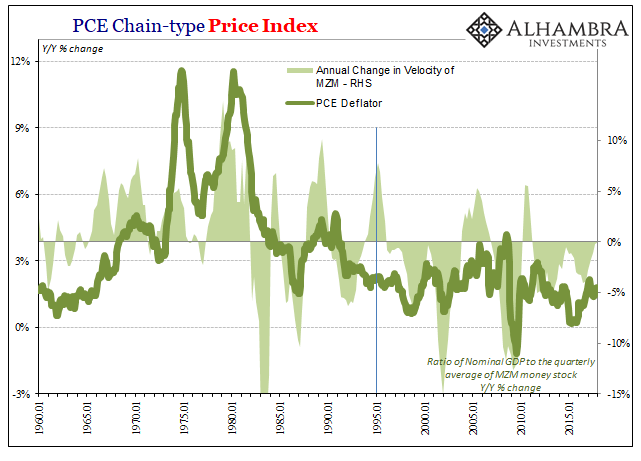 As a consequence, while of necessity it must be the case at the end of the day that inflation has to be a monetary phenomenon, a decision to base policy on measures of money presupposes that we can locate money. And that has become an increasingly dubious proposition.